I didn't have to go to Tagbilaran for an internet cafe, there are a few here in Panglao, aren't you surprised? I discovered one while we were doing our early morning walk, then I saw another while we were looking for a store to buy some stuff for cooking. We're virtually prisoners in paradise... and loving it! Panglao island is nothing like I expected - I thought it would be a lot smaller, where I could walk the perimeter - but I wasn't a bit disappointed. The resort where we're staying is on a cliff, a few minutes walk to the beach is the price we have to pay for a spectacular view. I don't mind the walk, though the kids and my mom do. 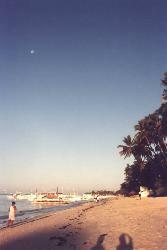 :) We're a few minutes away from Alona Kew beach. 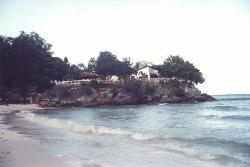 I was surprised that there're a lot of bancas by the beach, this area seems to be the starting point for many diving trips. We had an exhausting trip from Bacolod yesterday, much more so for the kids and my folks. Four hours road trip to Dumaguete (1hr of that was crossing a mountain - zigzag road), ferry ride to Tagbilaran, and finally about an hour drive to the resort. 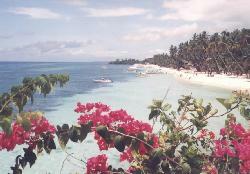 The first few minutes into Panglao island, the road was bad, but bearable. Afterwards it seemed to get a lot better, but at that point we were all so weary after a whole day of travel that the road condition didn't really matter by then. It was almost sunset when we arrived Tagbilaran and it was dark when we finally reached the resort. 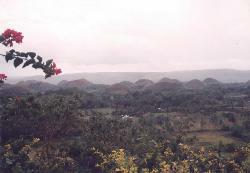 We're doing the natural/historical tour of Bohol day after next. Tomorrow is the Tagbilaran town fiesta, so we're having lunch at some family of a friend of a friend (of a cousin of a friend... etc. - some connection, huh?) More pigging out on Filipino (Visayan) cuisine. I'm trying not to get used to this life... If I wasn't me, I'd envy me. ;) Not that I'm an envious person. ha-ha-ha. We did the early morning swim, the kids will have a round-2 later in the afternoon, but I'll pass on that one. Instead, I'll have my camera in tow and take some sunset pics. Unfortunately we weren't able to join my friend's family to that town fiesta, but we've experienced Bohol hospitality, nevertheless. Earlier today when we got invited to lunch by the same family who invited us during the town fiesta. It still felt festive, not to mention the food prepared was of "fiesta proportions." and I ate nothing but seafood and (yummy, yummy) mangoes. Btw, just so you know, mango IS my favorite fruit. We had the tour yesterday. I was a bit disappointed because it started to drizzle on the way out of Panglao Island. I was praying that it would stop sometime, but just our luck, it got worse when we arrived at the town of Carmen near the Chocolate Hills. We couldn't have picked a better day to do the tour. Nevertheless, we enjoyed our day and took lots of pictures. I'm eager to go back to Bacolod to have the films developed. 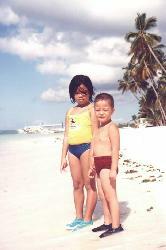 I had a great time in Bohol. I love the beach most of all. I'd probably go back there sometime in the future. We stopped at the Daius Church and my mom took some of the well water from beneath the altar. My friend's mom wanted some, too, and asked for a container from her husband - he brought her an empty Sprite can. We couldn't stop laughing even after we left the church. We went by Hinagdanan cave, too. I enjoyed the Loboc river cruise. We rented a motorized banca which took us to Busay Falls. except for some people doing their laundry by the river, the scenery was pretty much like the Snake River cruise I took at Grand Teton NP. 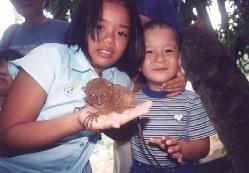 We also had some picture taking time with tarsiers. While we were waiting for our Cebu ferry yesterday, our Tagbilaran hosts brought us to the Bohol Tropic Resort by the pier. Nice resort, nice beach - considering it's in the port area. One thing I've noticed about Bohol (Tagbilaran and Panglao area) is that the water is clean even near public places.